wanderlust ATLANTA: Ice Cream...And So Much More! I finally made it to the Atlanta Ice Cream Festival in Piedmont Park. I'd wanted to go just for the ice cream, but ended up enjoying so much more! That's Carlton and Alyssa above, one of the couples we met while in line to partake in the exhilaration that is the "Human Hamster Ball". That was sooooooo much fun...exhilarating AND exhausting, but sooooo much fun! When we were in line, there was a couple in front of us (Curtis and Meagan) and a couple behind us (Carlton and Alyssa), all in their early to mid-twenties. Overhearing each other's conversations, we all discerned a high level of excitement about the forthcoming experience. It didn't take us long to figure out that we wanted to play human bumper cars! So we let a few folks go ahead of us so that the six of us could engage in what was for me a highlight of the afternoon. The guy running the attraction told us that we would have only two minutes [What?! Two minutes? C'mon! ], but that that we would find that to be plenty of time. He warned that it was hot inside--not a surprise, especially given it was a scorcher of a day--and that adults tire more quickly than kids do, on this particular 'ride' [Really?]. He wasn't kidding! It was so much fun, but for someone like me who hasn't darkened the doorway of a gym in forever...well, let's just say, it's two days later and I'm crazy sore! But I'd totally do it again. And again. And again. Great fun! Thank you Carlton, Alyssa, Curtis and Meagan for making "Human Hamster Ball Bumper Cars" such great fun! The Atlanta Ice Cream Festival is one of the smaller festivals I've attended in Piedmont Park, but what fun! [I know, I keep saying "fun", but it really was!] There were ice cream vendors (although I missed seeing King of Pops, High Road, and Jeni's...Where were you guys?! ), the expected festival food vendors, clothes, jewelry, crafts, publications, educational institutions...but I couldn't find a single ATM. Fortunately, many of the ice cream vendors accepted plastic. Yay! Being the sci-fi enthusiast I am [Or I should just go ahead and just admit to being a "sci-fi geek", with DragonCon coming up so quickly? 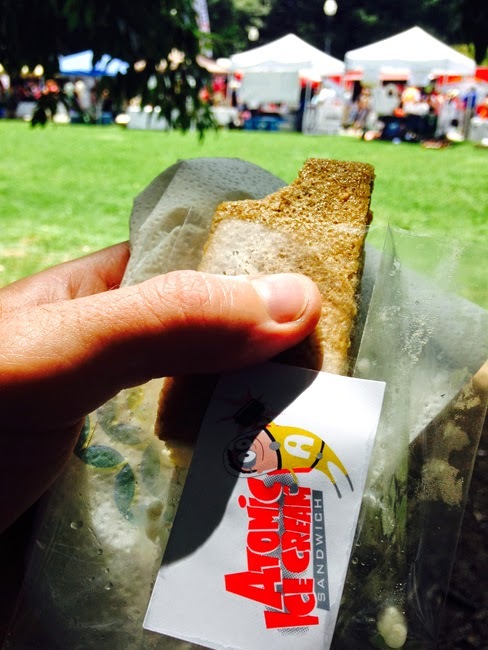 ], as soon as I saw Atomic Ice Cream Sandwich, I knew that was the one I wanted. 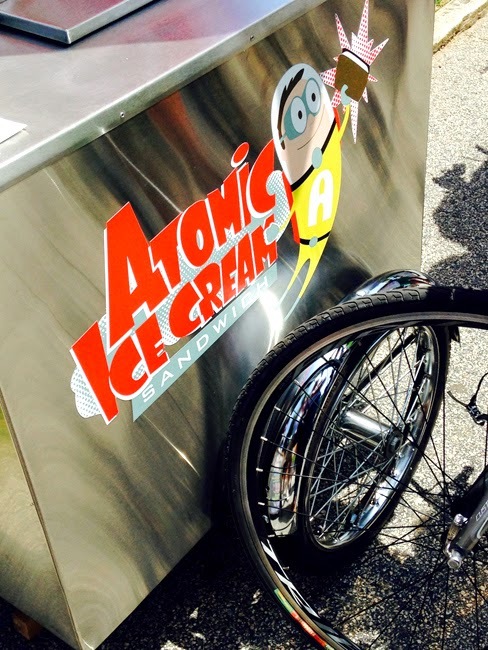 What I didn't know at the time is that Atomic Ice Cream Sandwiches are made here in Atlanta, from local ingredients! I love that! You can't tell it from the camera phone pic above, but yes, that's an ice cream sandwich and "Wow! "...it was amazing! Ginger cookie with peach ice cream...every bite a palate-pleasing piece of heaven. If I took my time, I could probably be a connoisseur of ice cream, but I just enjoy it too much. However, this one I did savor...I took my time--amazing control on my part. I want more! 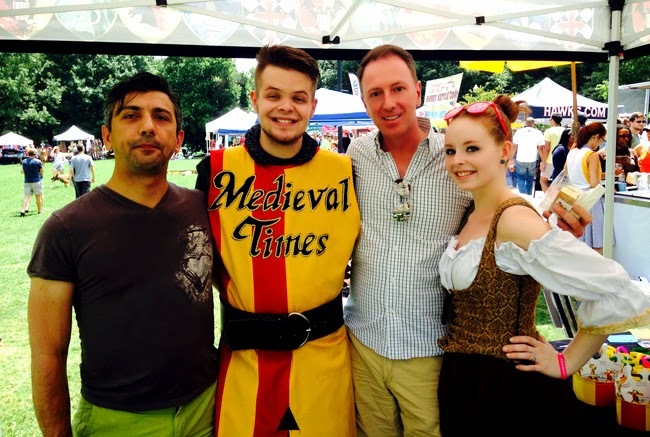 I was so excited to see Alyson from Medieval Times Dinner & Tournament, Atlanta Castle. She's always been incredibly sweet and Medieval Times is a totally awesome fun time! In the photo above, that's my friend Michele on the left [Smile, Michele, we're having fun!] and me next to the princess. My apologies to the princess and knight for not getting their names, so, glorious and gallant I'll call them..."Thank you" for the photo op! See you all soon. I mentioned Curtis and Meagan earlier, two of the folks we did the Human Hamster Ball with...they were with the Strayer race car! 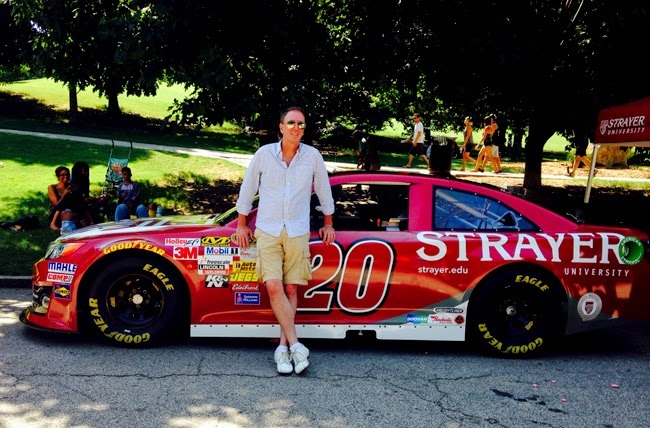 Now, I'm a far cry from a James Bond (although I was a Wyoming cowboy for a short time), but I do love cars. "Thank you," Curtis and Meagan for your hospitality...and the cold water! 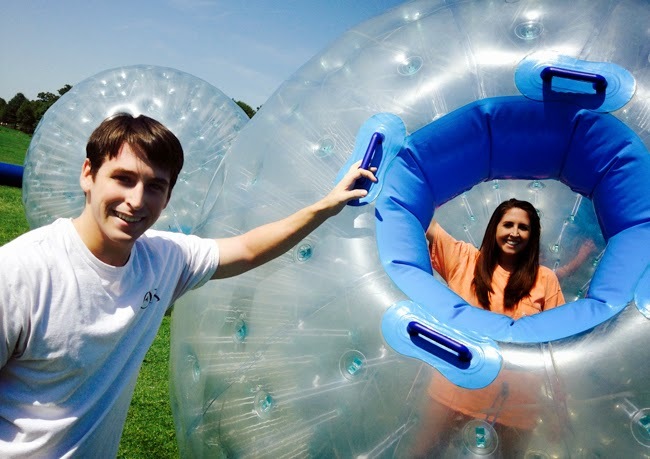 So, with ice cream in hand--I'm going a little out of sequence here--we headed down to the Human Hamster Ball experience, but when we got in line we overheard that they were only accepting cash. We had only six dollars cash between us. Well, we didn't venture down there for naught. 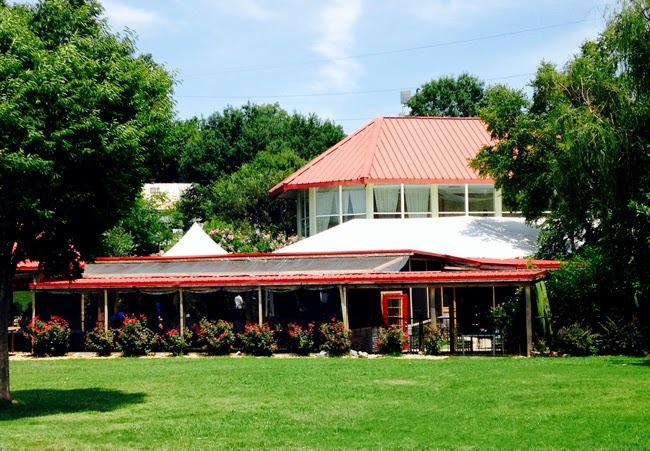 We kept on going and headed on over to Park Tavern (corner of 10th & Monroe), sat on the porch and enjoyed a cold glass of Sauvignon Blanc. I'd not been there in much too long. I'd forgotten how much fun it was, even after my friend Bethany talking about the great times she's had there. I'll definitely be back soon. 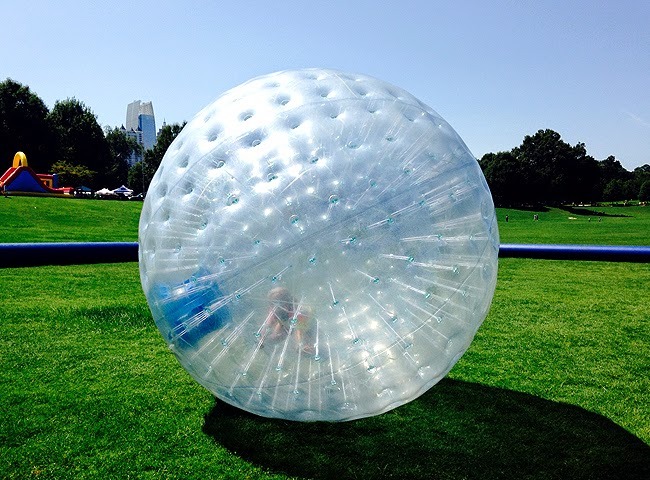 While I didn't see an ATM at the ice cream festival, there's one at Park Tavern, so on our way out we grabbed some cash and headed back to the Human Hamster Ball field! 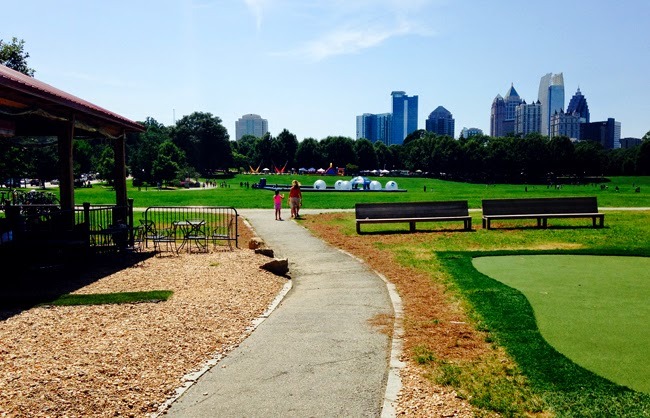 Check out that skyline view...that's one of the things I love about Piedmont Park, aptly dubbed "Atlanta's Favorite Green Space". When I lived in DC, one of the things I missed most was a skyline. In DC you can't build taller than the Capitol Building...or is it the Washington Monument? Either way, I missed the majesty of an amazing skyline. The Atlanta Ice Cream Festival may have appeared to be modest, and I foresee it being even bigger for its fifth year in 2015, but there was an awful lot of great fun to be had...in addition to having ice cream!